In this module, I overview ePals, a network site for educators across the globe, for use in the foreign language classroom. One of the most stressed aspects of foreign language education is to teach authentic lessons. Additionally, culture and communication are the two most important standards for world languages. ePals provides a way for students to communicate and share cultures with others in an authentic setting. With classrooms in 200 countries and territories, ePals makes it easy to connect learners locally, nationally, or internationally. It is the leading provider of safe collaborative technology for schools to connect and learn in a protected, project-based learning network. 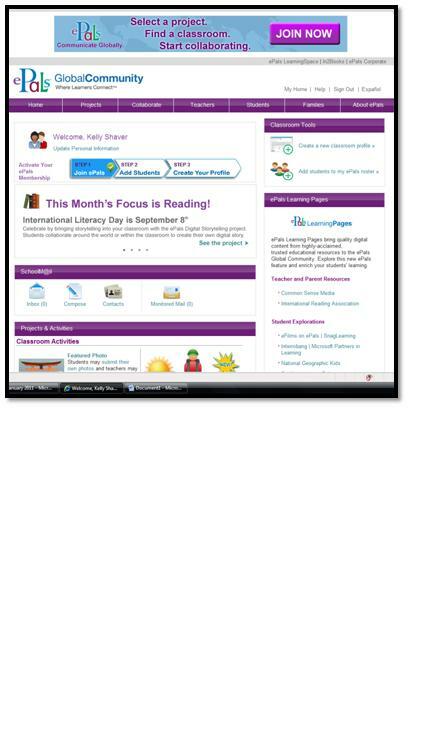 ePals includes products such as ePals Global Community, SchoolMail365, LearningSpace, and In2Books. 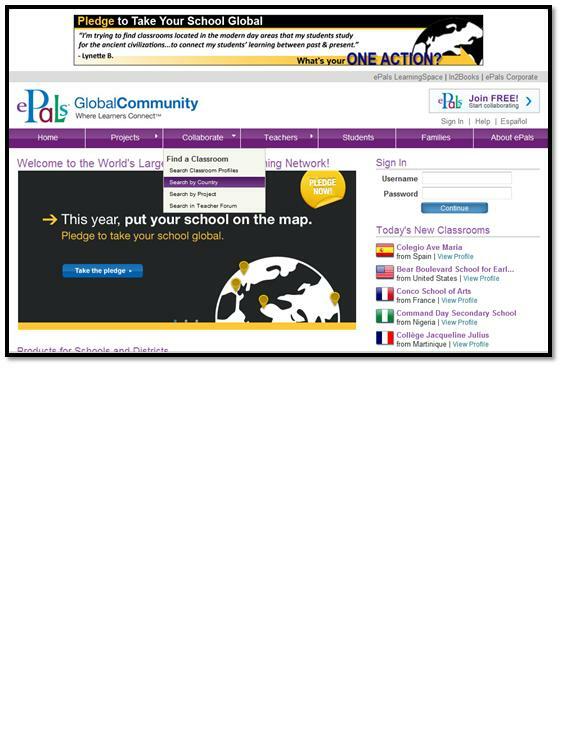 This tech module will focus on ePals Global Community and even more specifically, Classroom Match. 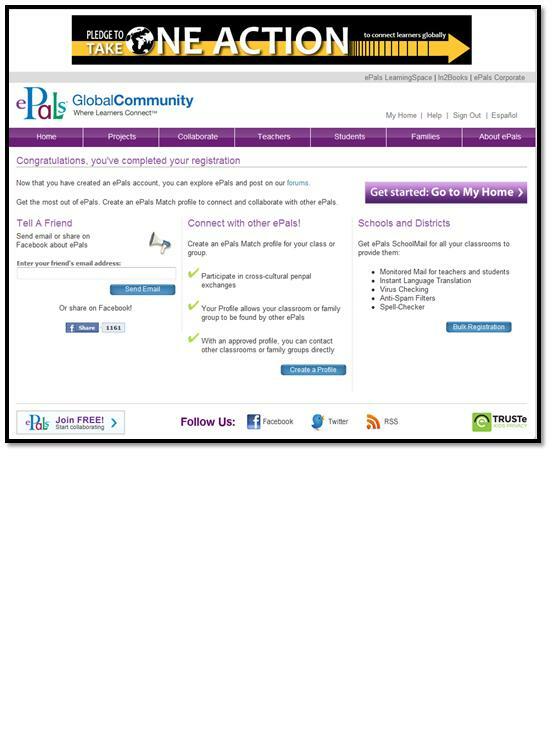 With ePals Global Community, educators can access the community to find collaborative projects, join discussions in the community forums, and search thousands of classroom profiles to engage with others in authentic exchanges - all within in a safe, protected online environment. Classroom Match is the component of ePals Global Community that helps educators connect with other classrooms by searching profiles based on project topic, student age range, country, language, and more. The first step to joining the ePals Global community is creating an account. An educator can follow the instructions below to join for free! 1. On the home page, click the “Join FREE!” button in the top right hand corner. 4. This is your home page. From here, you can add students, create a profile, search for other classrooms, and more! After joining, a teacher can peruse around the site and see all that ePals has to offer. Specifically, a teacher might want to learn how to use classroom match, complete ePals projects, use forums, and more. Clear and detailed directions for these ePals options are located on the support page. 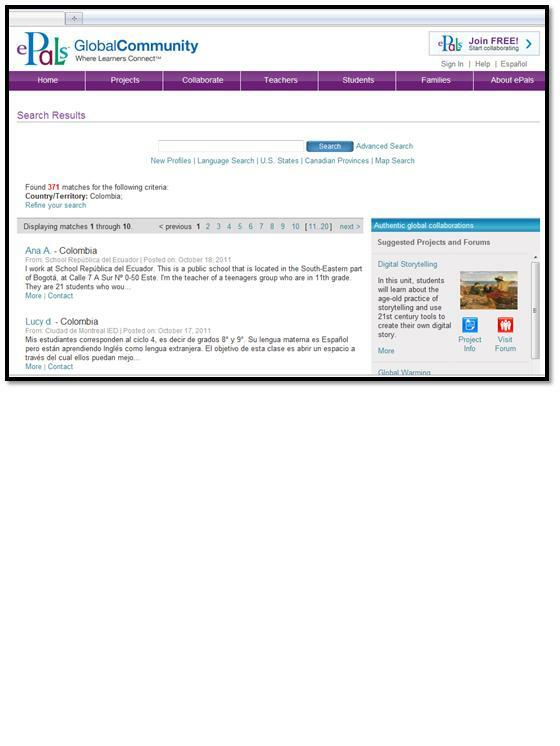 A particularly good way for foreign language teachers to find ePals learning partners is to search by country. Instructions to search by country are listed below. 2. Click on a continent where your target language is spoken to see a list of potential ePals learning partners. For this example, we will click South America. 3. Now, narrow your focus by clicking on the specific country in which you would like to find classrooms. For this example, we will click Columbia. 5. 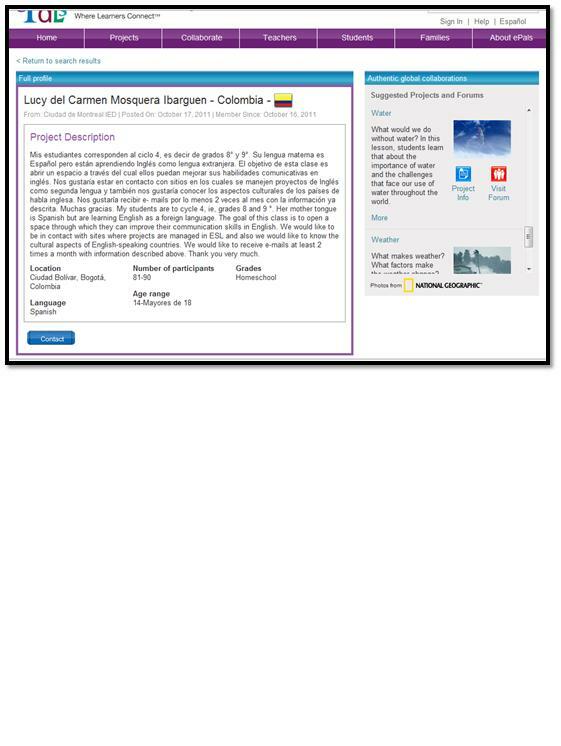 Once you click on a teacher’s name or on the more button you will see a project description similar to the one below. 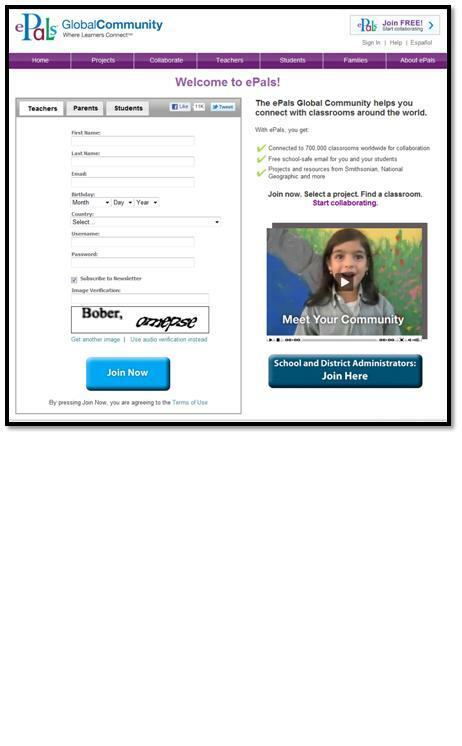 It is on this page that you can also press the contact button to start communication with the teacher. 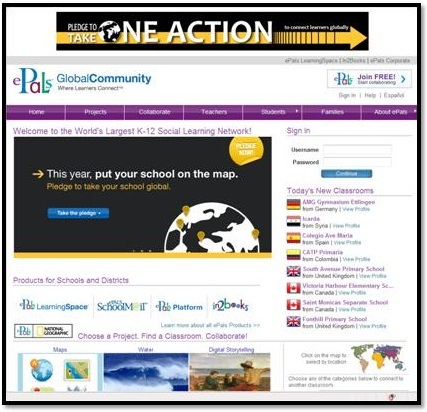 Many educators use the ePals Projects Forums to look for classrooms across the globe that may want to work on a project with them. One example of this is the Holidays and Festivals Teachers Forum. All of these teachers are looking for partner schools to do a cultural related project based on holidays and/or festivals. Specifically, Laura B. is a teacher from New Jersey, USA with approximately 40 students ranging from ages 11 through 14. She is looking to communicate with any other groups (not language specific). As you can see, she received several responses of interest from educators in all different countries. Only time will tell whether Laura works with a teacher from France, Turkey, Mexico, or another country—ePals makes classrooms across the globe completely accessible! A teacher from the USA was highlighted in the ePals teacher spotlight for her project. Her students, with the help of ePals, contacted another music teacher across the country. Both classes’ music teachers along with their schools’ technology teachers helped their students create a PowerPoint about their region. The music teachers also worked with students on songs about their region to share with the other school and questions for students to ask about the other region. The music teachers then sent the PowerPoints to each other and the classes came into contact via Skype. During the Skype session, the two classes shared PowerPoints, asked each other questions, and sang songs. Due to ePals, students from across the country were able to connect and were provided an opportunity to learn from a different music teacher than their own. Even after the Skype conversation was completed, students mailed materials about their region to the other classroom. Click here to learn more. A teacher from Lebanon created the collaborative project “Outside My Classroom Windows.” For this project, students looked outside their classroom windows for five minutes and drew what they saw. Afterwards, the teacher used ePals to connect to other classrooms across the world. The students in the other countries also looked out their windows and drew what they saw. The students from the different classes then swapped their drawings and had the opportunity to compare and discuss their different localities. The teacher from Lebanon also created a blog to show all of the different drawings from all of the different classrooms. To view the project blog, click here. The blog includes posts from Steamboat Springs, USA, Hattonvale, Australia, and Beirut, Lebanon. As you’ll see, the drawings provide an easy, visual way for students to learn about different cultures and environments across the globe. Even better—they’re learning from their peers!